With all the Valentine’s Day prep hustle and bustle this week (on top of sports practices, appointments, meetings, and errands), this Instant Pot Chicken Enchilada Soup recipe was a lifesaver for me! It comes together quickly and easily and is perfect for the days when I just HAVE NO TIME. And this soup is easy, people. Like really, REALLY easy. We’ve been having super whacky weather here lately…one day it’s cold, the next day it’s hot. I can’t keep up. But when one of those chilly days hit, I was ready to bundle up in my comfy sweater and I wanted some hot, savory, soul-warming soup. And boy did this Instant Pot recipe deliver!! And it satisfies my craving for Mexican food like nobody’s business. Chicken enchilada soup is kinda like all the flavors of traditional enchiladas melded together in one deliciously comforting bowl. I have made this before in a slow cooker, but now that I have an Instant Pot, I can get this soup on the table in about 30 minutes. It’s a lot less work to prepare, a lot less clean up, and the best part? It’s just 1 Point per serving! Does it really get better than that? I don’t know about you, but all these new changes with the Weight Watchers Freestyle program have made a huge impact for me. The zero Points food list is comprised of many of the foods I cook with on a regular basis, so it has really helped me create a lot of low Point recipes that are ridiculously satisfying. Besides being super easy to make, I love that this Chicken Enchilada Soup recipe calls for ingredients that I almost always have on hand in my pantry or freezer. So on a busy day where I may not have had the time to plan out a dinner, I can whip up this soup in my Instant Pot in no time! If you meal prep, this soup is an ideal recipe to use. It reheats like a dream! Just make a big batch, and store in some individually portioned freezer safe containers. Store it in the fridge or freezer for anytime you need a quick, ready meal that is super low in Points and high in flavor. Right before serving, top it with any of your faves like fresh avocado slices, diced onions or chives, a sprinkle of shredded cheese, sour cream….you get the idea. When I make this for my family, I usually set out bowls of all the toppings, and they all enjoy picking out their own toppings for their soup and making their own little creations. Need some more Instant Pot Recipe ideas? Check out some of my other popular IP Recipes! If you guys love this Chicken Enchilada Soup recipe as much as I do, or if you make it yourselves, please let me know!! Take a picture and tag it #laalooshrecipes on Instagram so I can see it and swoon. I always love to see your interpretations of my recipes! A fiesta in your Instant Pot! 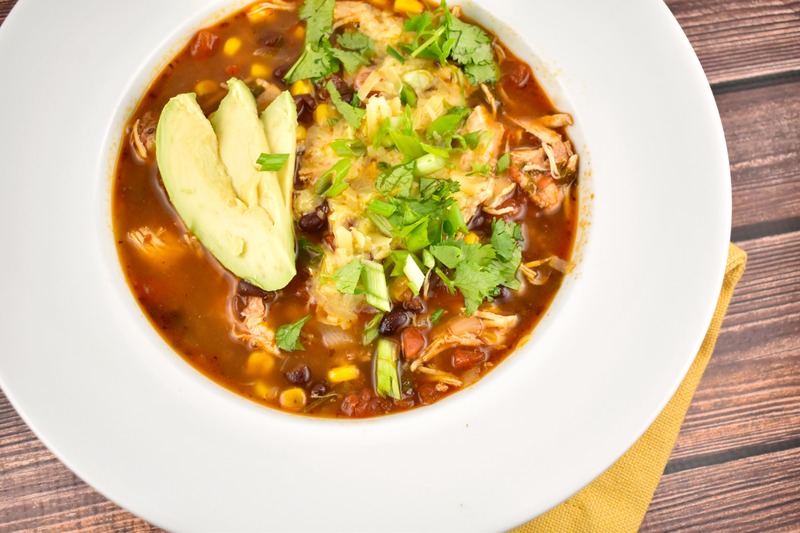 This soup is exploding with fresh, bold flavors, tender chicken, juicy tomatoes, and satisfying black beans and corn. It’s a perfect weeknight meal that the whole family will love. Set Instant Pot to saute. When hot, add in oil. Then add in onions and garlic, and saute until tender, about 2 minutes. Pour in the chicken broth, enchilada sauce, diced tomatoes, chipotle in adobo sauce, beans, corn, cumin, salt and pepper. Stir well. Add in chicken breasts, making sure chicken is fully covered with sauce. Cover and cook on high pressure for 20 minutes. Release quick or natural. Shred chicken with two forks, and stir in cilantro and lime juice. Taste and adjust seasonings as needed. Spoon into bowls. Garnish as desired and serve. OMG!!!! That was hands down the BEST soup I have ever made. The flavor was perfect! I am of Mexican descent and the flavor was reminiscent of something my mother would make. THANK YOU and this is the first time i used my intsapot which frankly was rather scary. THANK YOU!!!! And only 1 point. Hi there, this looks amazing….however I am trying to use the Points Plus calculator to figure out the point value and there is not protein amount listed? Is it possible to get that? Thank you! This was superb! My very first InstaPot attempt and it couldn’t have been better (or easier)! Thank you!!! So glad you liked it!! I LOVE how easy the Instant Pot is to use! !